15 Teams are contesting in this years Microsoft Imagine Cup Middle East and Africa Finals underway in Beirut, Lebanon. The Imagine Cup competition is Microsoft’s global completion for student developers. It empowers the next generation of computer science students to team up and use their creativity, passion and knowledge of technology to create applications that shape how we live, work and play. This years Imagine Cup Finals already has an aura around it seeing it marks a milestone and not forgetting the $ 100,000 top price package. 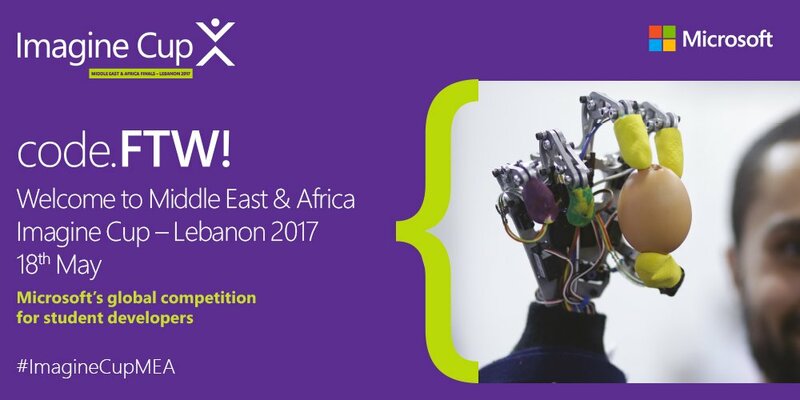 Imagine Cup Middle East and Africa finals 2017 is being hosted by Microsoft’s Lebanon Team. The 3 day event, 18th to 20th of may is taking place at the American University of Beirut, Lebanon. The grand final and awards ceremony will take place on Saturday 20th. Team Beacon – Nigeria – an app connecting emergency service providers with those needing assistance. Follow the Microsoft Imagine Cup Middle East and Africa Finals competition event on social media via the hashtag #ImagineCupMEA. Don’t forget to cheer your team on. All the best to all teams and hopefully they all impress at the finals in Seattle, Washington later this year. Teams Green Jam (UAE), Bl!nk (Lebanon), DocStroke (Jordan), E-Park (Morocco), Beta (Oman) and WaCoMo(Qatar) have qualified for the world finals in Seattle.